Race results are IN! 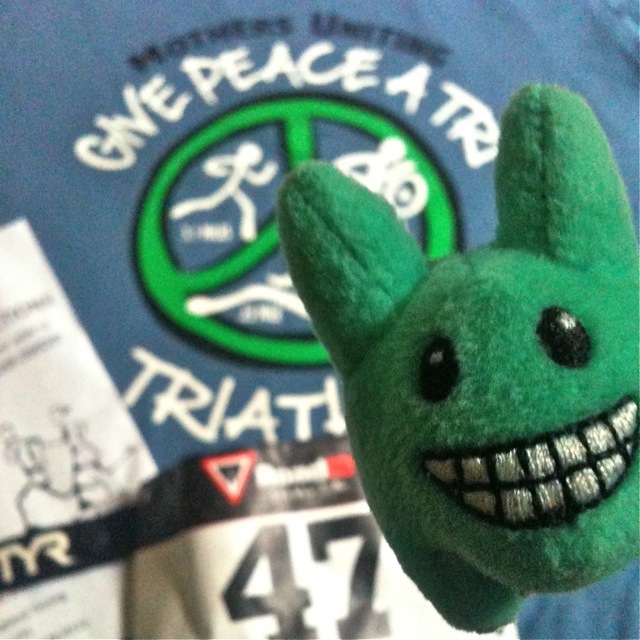 Masher competed in this year's Give Peace A Tri sprint race benefiting Mothers Uniting, a group that works to create a non-violent and just world for all children. Due to damaging floods in NH, the race was moved at the last minute from Surry Mountain Lake to nearby Otter Brook State Park. You can read more about this in the previous entry regarding Masher's pre-race intel. 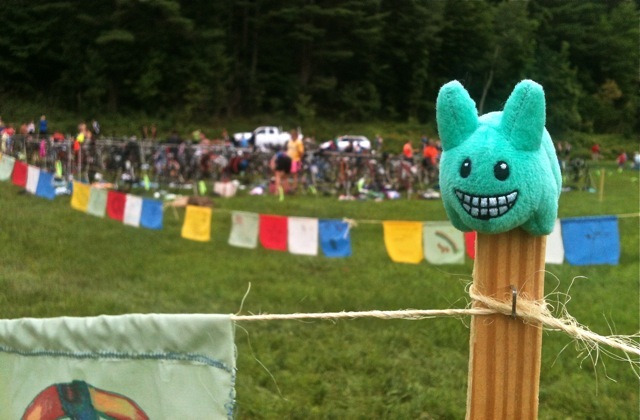 The course thus went from pancake flat to hilly, but Masher's preview made him confident he was ready for the challenge. 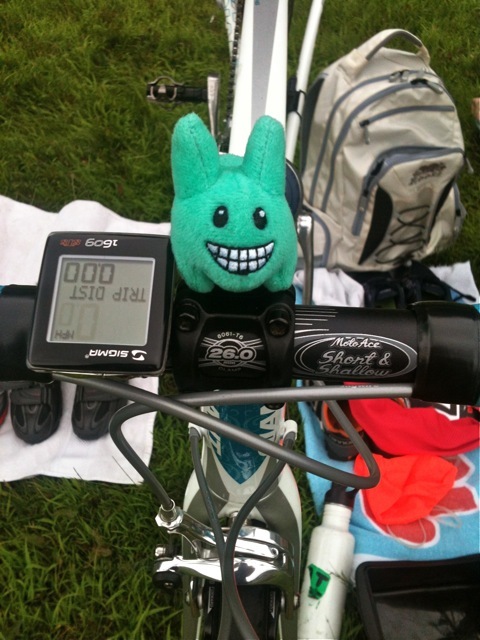 He arrived at the race to see parking, the swim course and the transition area all well marked. 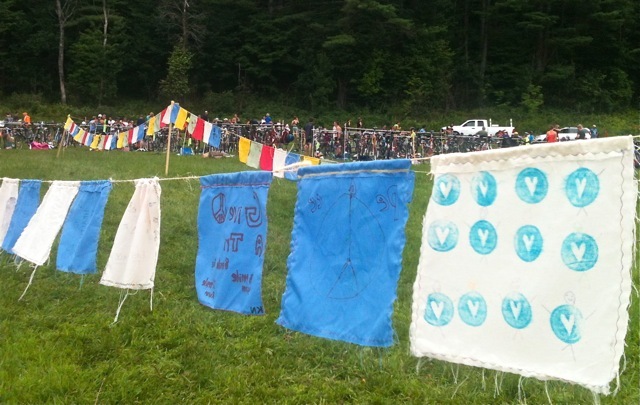 These pretty prayer flags, decorated with local school childrens' visions of peace, lined the chute from the swim to transition. It was a beautiful touch and made the race feel celebratory. Masher signed in, got his bib number and timing chip, got Sharpied up with his race number, and hit the racks to set up transition. Having two triathlons under his race belt he felt at ease this time about set-up. This year he was a lot less nervous and he left plenty of time to get in a warm up swim. After a warm up swim around half the course, he splashed around in the water to stay warm. Once the pre-race announcements were done, he waded into knee deep water with his wave (hmm, knee deep start really gives the taller racers a bit of advantage) and...GO! He was off! Last year, being a brand new swimmer, he got dropped by his wave, swam alone for a time, and then the wave after him caught up, chewed up the water around him and spit him out. After all his time with Masters Swimming this fall and winter, he got more confident in the water and stayed with his wave. He even passed people in wetsuits! Swimming in a crowd means the water's a lot choppier and he did get stuck behind a few people he couldn't pass, but he is super proud of keeping up with the big boys this year. 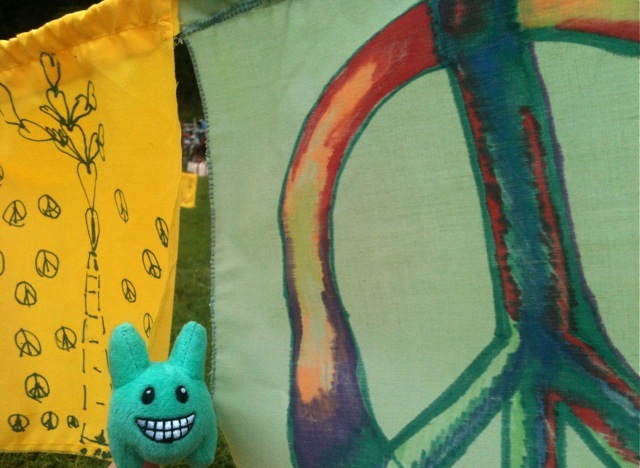 A quick hop through the peace banners and Masher was off on his favorite leg of the race - the bike! This was a HILLY course. He kept a good pace on the hills but got passed by quite a number of really strong cyclists. He pined for last year's pancake flat course (mmmmm, pancakes!) but huffed his way along. On the run he enjoyed the shady path through the park and a sunny patch along the dam. He saved some energy on the bike ride (not going all out on the hills) and gave it all for the hilly run. Swim, bike, run and DONE! 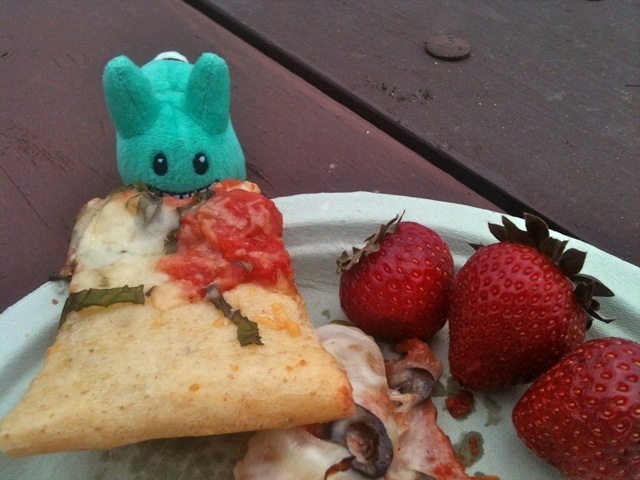 The smell of pizza greeted Masher as he crossed the finish line and hit the food tent for some amazing pizza by Little Zoe's Pizza, some strawberries and blueberries, and of course - a cookie. WHOO HOOO! Great times for a hilly course AND, way to move up in the rankings! Another thing to be happy about: no flat tire this year! Masher's busy now getting his McBuns in shape for his first olympic distance tri: The Otter Limits Tri on September 14, 2013. Way to go Masher McBuns!